Department of Community Medicine, R.D. Gardi Medical College, Ujjain has organized many activities on this occasion. 1. CME on worlds AIDS day was organised on 1st December, 2016. The CME invited more than 300 undergraduate medical students and medical faculty with a learning objective to increase awareness of issues surrounding HIV/AIDS and to discuss current recommendations for HIV prevention, treatment, and counselling services and attached social stigma. Dr. M.K. Rathore, the Dean, inaugurated the CME. Inauguration was followed by enlightening sessions on issue from HIV past and future, by RDGMC faculties, Dr Arpit Verma, assistant professor; Dr B.L. Bamboriya, Nodal officer ART centre; Dr Saket Kale, assistant professor, community medicine and Dr Kirti Deshpande, HOD and professor, community medicine. The CME was moderated by Dr Vibha Arjaria, demonstrator, community medicine, RDGMC. The CME would not have been successful without Dr Anil Bhagel’s and Dr Rashmi Bhujade’s contribution. 2. 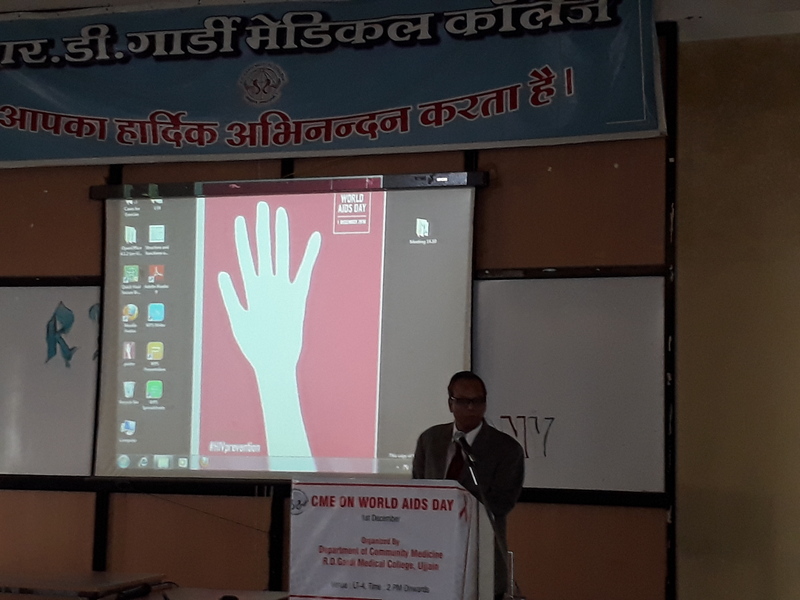 AIDS awareness sessions were organized in medical college and urban health centre by Dr. Sanjay Chourasia, Dr. Rashmi Bujade, Dr. Vidit Khandelwal and Dr. Anil Bhagel for the health workers, community people and informal health providers.